The Venerable Rinpoches were born and raised in the Dhoshul region of Khamin eastern Tibet near the sacred mountain Jowo Zegyal. Their family was steeped in Vajrayana Buddhism for generations, and among their ancestors were many great scholars and practitioners. Their father’s family inherited the responsibility of administering the local retreat center, Gochen Monastery, and their grandfather was chant master in charge of ritual ceremonies. 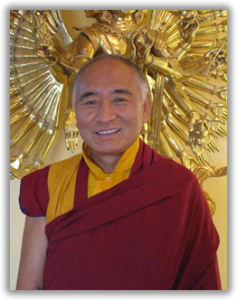 His Eminence Khenchen Palden Sherab Rinpoche (1938-2010), the eldest of the two, was one of the most qualified scholars and teachers of the Tibetan Buddhist tradition. He was fully versed in all areas on Buddhist study, authored several volumes of learned works and Tibetan language books, and was a master of Dzogchen. Ven. Khenpo Tsewang Dongyal was enthroned as a Nyingmapa abbot by H.H. Dudjom Rinpoche. He is a holder of the complete Nyingmapa lineage as well as a beloved teacher, poet, artist and author. H.E. Khenchen Palden Rinpoche began his intensive monastic training at the age of six at Gochen Monastery. So strong was his desire to study and learn that he would sneak outdoors after curfew and into the shrubberies to read his books under the moonlight. At age 12, he entered Riwoche Monastery, one of the oldest and largest monastic institutes in eastern Tibet and famous for its philosophers and logicians. There he was trained to become the next Abbot of Gochen. He completed his studies just as the Chinese invasion reached the area. Ven. Khenpo Tsewang Dongyal Rinpoche was born in the same mountain region as his brother. Soon after his birth he was recognized as a tulku, the reincarnation of the Venerable Sherab Khyentse Rinpoche, a renowned Abbot of Gochen Monastery. 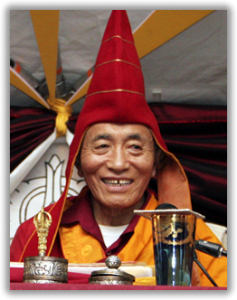 Beginning his education at the age of five, Khenpo Tsewang Rinpoche entered Gochen Monastery; however, his studies were interrupted by the occupation and he escaped to India with his family. The two scholarly brothers (also known as the “Khenpo Rinpoches”) made their first trip to America in 1980, and in 1982 moved to New York to work closely with His Holiness Dudjom Rinpoche. In 1985, the Khenpos founded Dharma Samudra, a non-profit publishing organization which began by publishing a Tibetan edition of 11 volumes of the hidden treasure teachings revealed by the great terton Tsasum Lingpa in the 17th century. Collectively they are the authors of several learned works: Tibetan language books, poetry, grammar texts, Buddhist philosophy and practice, logic and tantra, and historical perspectives. Over twenty of their books dealing with Tibetan Buddhism are available in English. So highly respected are the brothers that they have received many honors, appointments, and recognition from His Holiness Dudjom Rinpoche and other significant Tibetan leaders, including His Holiness the Dalai Lama. In 1989, the Khenpos founded Padmasambhava Buddhist Center (PBC), a non-profit organization to teach the authentic word and practices of Tibetan Nyingma Buddhism and established the first center in New York. PBC now has chapters in over 20 cities in the USA, Russia, Canada, and Puerto Rico, plus monasteries in India, Russia, and at their main stateside monastery and retreat center in upstate New York. Since that time, the Khenpo Rinpoches have served as the directors and spiritual leaders at the various PBC centers and monasteries. They have maintained an active travel and teaching schedules that include annual visits to their centers where they give talks, teachings, and individual meditation instruction to their devoted sangha (community) of students. In fact, the Khenpo Rinpoches’ dynamic teachings and skillful insights make the simplest to the most complex teachings of Buddhism applicable to every aspect of our busy Western lives. Their vibrant personalities and humorous wit have delighted students, while their example of devotion to Tibetan Buddhist practice have inspired and attracted a multitude of practitioners. Ven. Khenpo Tsewang Dongyal Rinpoche traveled and studied with His Holiness Dudjom Rinpoche, as well as with his late brother, Vajrayana master and scholar Venerable Khenchen Palden Sherab Rinpoche, and his father, the hidden yogi Lama Chimed Namgyal. As a holder of the complete Nyingmapa lineage—kama, terma, and Dzogchen teachings—Khenpo Tsewang Rinpoche is fully versed in the Theravada, Mahayana, and Vajrayana schools, and is a master of Dzogchen, the most advanced tradition of meditation practice in Tibetan Buddhism. He is the author of several learned works in Tibetan, and has co-authored over twenty Dharma books in English with Khenchen Palden Sherab Rinpoche. Khenpo Tsewang Rinpoche travels extensively within the United States and throughout the world, giving teachings, empowerments, and personal guidance at numerous retreats.